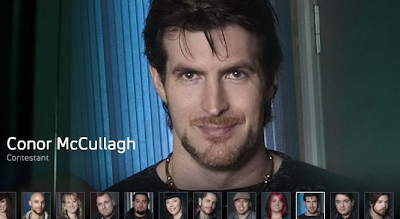 Conor McCullagh wins SyFy's Face Off! Congratulations to Conor McCullagh, Opening Night of the Living Dead's Makeup Effects Designer for winning SyFy's hit makeup effects reality show Face Off. In addition to leading Joe Blasco's makeup team and creating many striking zombie effects, Conor created the stunning Zombie No. 1 featured in the new ONLD teaser video. We look forward to working with Conor in the future and can't wait to see what he does next. 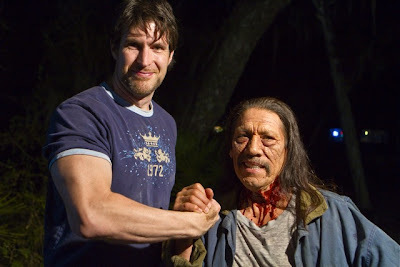 Conor with Danny Trejo on the set of ONLD! 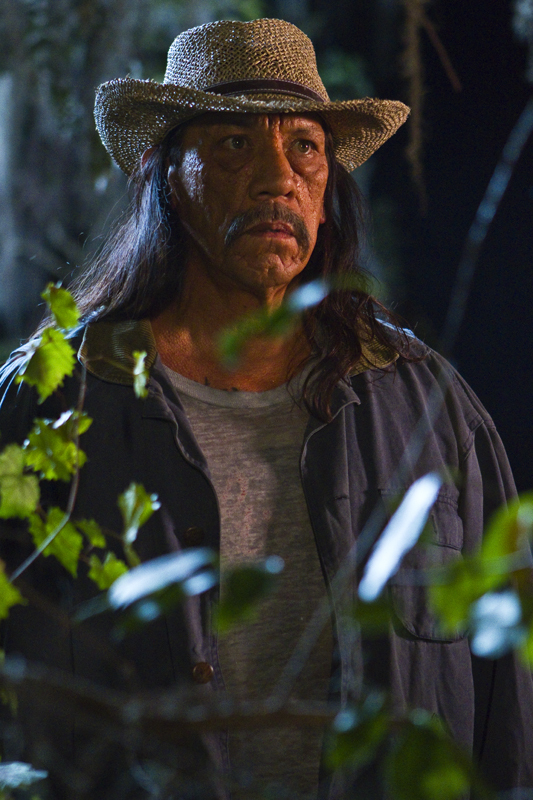 Danny Trejo, who recently appeared in the smash hit film Machete directed by Robert Rodriguez has signed on as a featured character in the Zombie horror-comedy Opening Night of the Living Dead. Danny was on set this weekend in Groveland, Florida at the Kim Kahana Stunt Ranch shooting several scenes from the film, fresh from an appearance at the local horror convention, Spooky Empire. "Having Danny in the film just takes it to another level," commented Producer Jay Lavely. "He's Machete -- but he transcends the genre because he's also a great dramatic actor and has comedic appeal as well from his work on the Spy Kids films." Director Brian Bazala frantically wrote new dialogue for the actor. 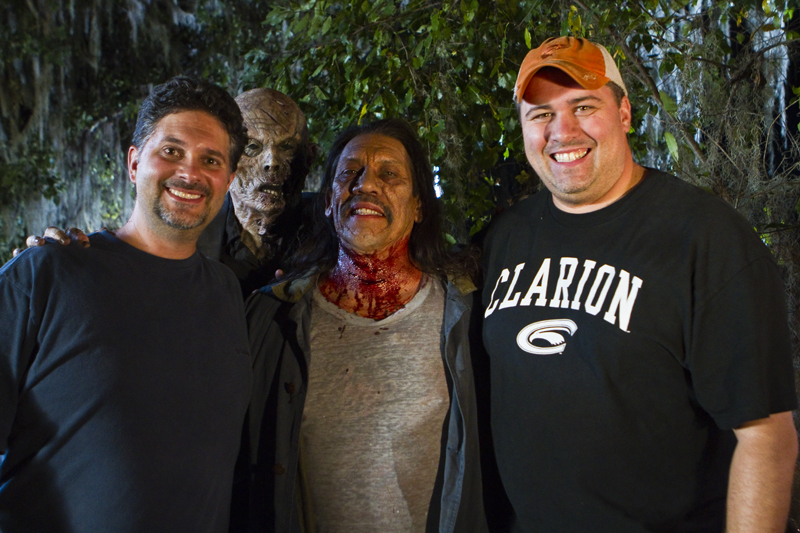 "It's Danny Trejo -- so I really wanted to tailor the character for him. He did not disappoint." Bazala also added that "Danny's got to be once of the nicest, most gracious actors in the business." Bazala also said Trejo was "extremely complimentary" and put the entire crew at ease, shooting around his tight schedule for the weekend. Opening Night of the Living Dead will be shot in and around Orlando, Florida and features makeup by Joe Blasco. Director Brian Bazala gives the latest update on the Halloween Horror Zombie Film Opening Night of the Living Dead from Kahanas Stunt School . 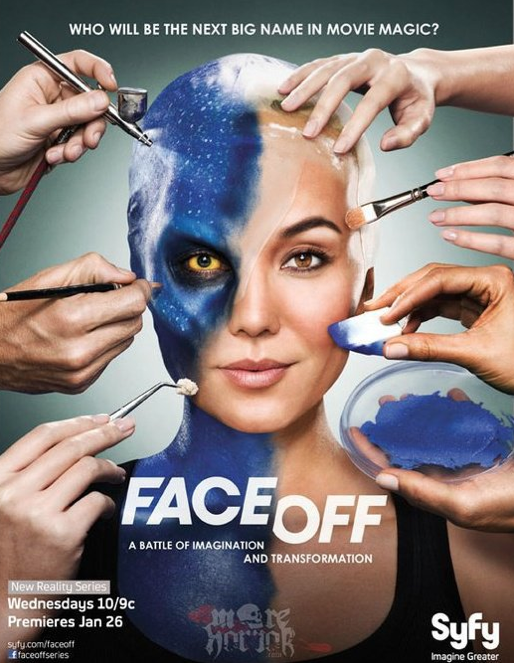 The film features makeup by Joe Blasco. Today we broke ground on our cemetery installing realistic foam headstones. Producer Jay Lavely also arrived to survey the situation (he's behind the camera in this clip!). Making Foam Headstones for the Halloween Zombie Movie Opening Night of the Living Dead featuring Danny Trejo with horror makeup by Joe Blasco, shot in Orlando. In Part 3, Scenic Designer Molly Pearce puts the finishing touches on the prop headstones with a little faux painting. Making Foam Headstones for the Halloween Zombie Movie Opening Night of the Living Dead featuring horror makeup by Joe Blasco. In Part 2, Scenic Designer Molly Pearce adds some authentic detail to the primed foam headstones. Copyright 2010 Living Dead Film Partners. Awesome Inc. theme. Powered by Blogger.